Performance meets safety: This is the headline about the EMOTION. 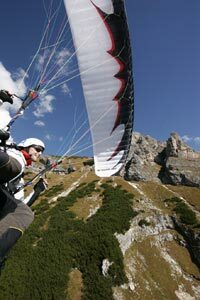 This DHV-1-canopy not only provides lots of fun in the air, but also much, much passive safety due to the AFS-system. In brief: Good emotions. 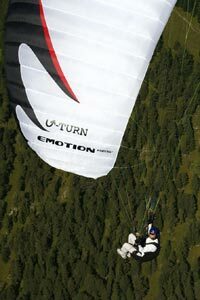 The aspect ratio of the EMOTION has been slightly reduced in comparison to the BODYGUARD, the reference model among the safest category 1 paragliders. Nevertheless constructor Ernst Strobl has decreased the curvature at the wing ends. The EMOTION gains agility and improved handling reaction because of this. The AFS system provides the safety and security: The Automatic Flight Stabilization influences all cells and prevents in the majority of all cases unpleasant asymmetric deflations already during their initial phase. The EMOTION is delivered from the factory with a conventional harness. In this way we can fulfill the wish of those flying students who wish to start in the "normal" fashion with the corresponding start procedure. Additionally the B-stall as a method to lose height quickly can be instructed and practised. The EMOTION can be made available optionally with the well known divided riser system. With this the EMOTION can perform the B-stall safely, that is sinking at a rate of around 5m/s while still being fully manoeuverable with a glide ratio of 1:3,5. This for example makes it easier for inexperienced pilots to land on small landing areas which is more dificult to manage when the maximum gliding ratio has to be used without the B-stall technique. In any case the EMOTION is very suitable for instruction purposes with both harness systems. Another feature is available for the EMOTION as well: It is fitted out with the MYLAR-FIX-system, the unique folding system to protect the sensitive leading edges and air intakes. The EMOTION is available in four colors and in the sizes XS (55 – 80kg), S (70 - 90kg), M (85 - 110kg) and L (100 -130kg). 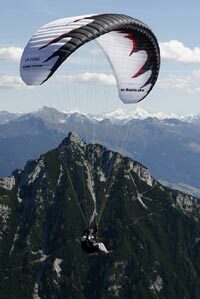 This excellent performing 1-category paraglider closes the gap which lies between the BODYGUARD and the INFINITY II.